Hi, I have a problem with my hearthstone account. 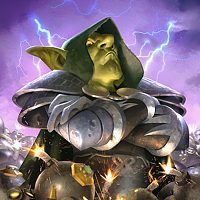 I am an avid arena player, I play 6+ hours a day. I keep going into arena wanting to play Warrior class however I never get it. I have literally queued up into Arena and in the past 10 runs Warrior was NEVER a hero choice. This is clearly a bug or my account is flagged. There are 9 classes in total with 3 heroes every arena, basic probability is I should be able to see Warrior appear 33.3% of the time every run. Lets say its nerfed since the game has terrible balance issues and there is a coded 25% chance. In my last 10 runs it did not appear once which means the occurrence of me not getting warrior as a choice was 1 in 35,782. or 0.00279%, essentially I should have a had a 99.99% chance of it appearing at least once in my last 10 runs. With a 99.99% chance I don't find it possible to never get warrior in arena, this is extremely disappointing as it is my favorite class to play. I am currently on my 11th run and have gotten "shaman, druid, paladin" still no warrior. RNG does not keep history. You had a 33% chance to get Warrior offered, and a 67% to not get it.